I walked through the garden today to see if I needed to water anything. Considering how dry it's been, the soil was moist to the touch under the thick hay mulch. I looked up to see a few of my co-workers taking photos with something that looked suspiciously like garlic. I went over to see what the excitement was about, and indeed, they were ooohing and aaaahing over a lovely crown of garlic newly plucked from the soil. I offered to take a photo of the three of them with their camera, and went back over to my garlic stand. What was under the soil? What did my crowns look like? I couldn't wait, so I got a little hand trowel and dug up a crown. Oh man, it was huge! I mean, I had no idea what I'd pull out of the ground, and the size of this "duganski" crown surprised me. The crown is nearly three inches wide, and it's just asking to be eaten. While garlic needs to cure for long-term storage, I couldn't wait to see what was inside. The crown after cutting off the top, roots and peeling back the first few outer layers. 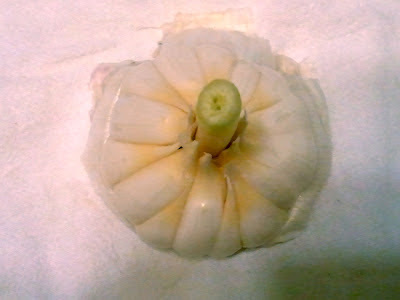 The crown after peeling off all the outer layers. 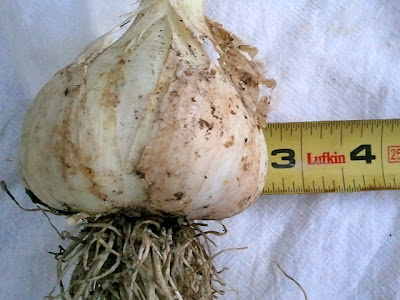 About this garlic - Duganski, ordered from Territorial Seed Company. Planted in October under heavy mulch. Pulled mulch aside in March. Fertilized twice with Bonnie Herb & Vegetable 8-4-4 Plant Food. This crown pulled on June 25, 2012. 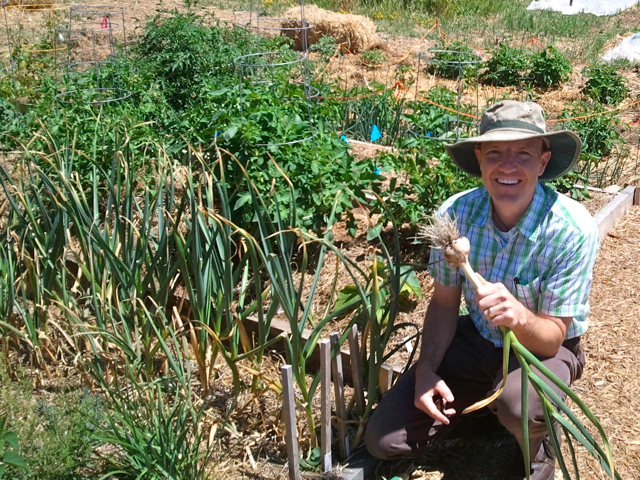 You can learn more about how to prepare garlic for long-term storage at this great video. I'm going to take this guy's advice and dig one crown a week to see how they are doing - I want to maximize size while getting them out of the ground before the outer skins begin to disintegrate, compromising long-term storage. 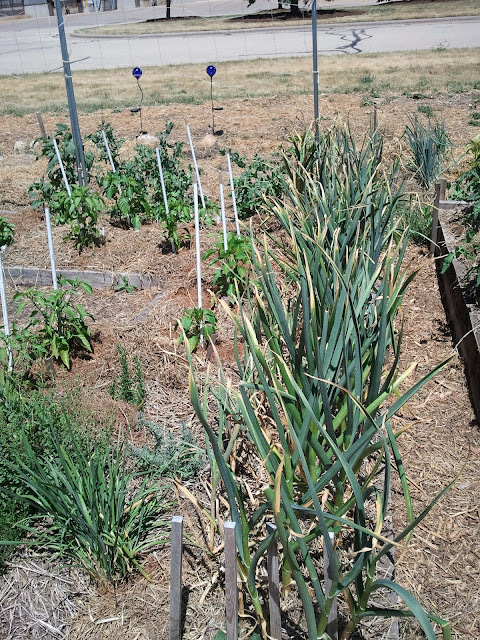 Please share your garlic stories here; when do you pull your garlic out, how do you prep and store it, and what's your favorite varieties for growing in northern climates? On further reading about this particular variety of garlic, it's supposed to have "Purple outer wrappers protect the violet-tinged cloves." 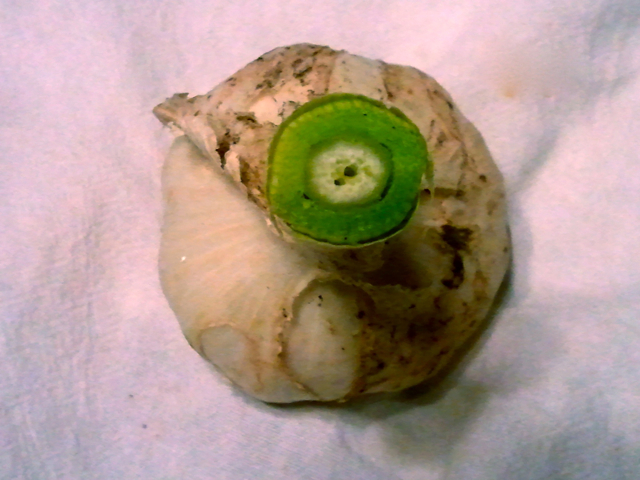 The skin was white and you can see the cloves are too. Definitely lots of time to go before this is actually ready to harvest! what a beauty, fresh garlic!! I love garlic! We will be pulling ours at Primrose Valley Farm this week. Looking forward to meeting you at our dehydrating and canning workshops this summer, Josh. Feel free to write about us! read articlеs or reviews, howevег thiѕ website provideѕ qualitу basеԁ articles. Keeρ this gοing pleaѕе, great јob! Greetingѕ! Very usеful advice in this partiсular post!